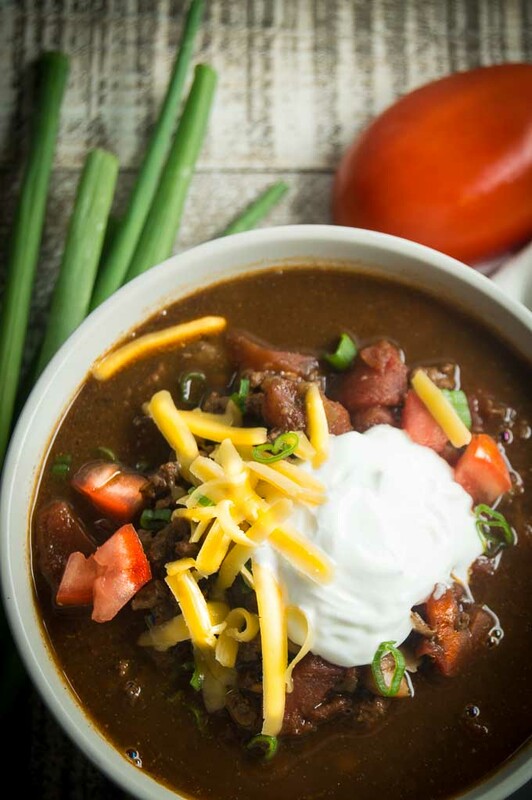 Healthy Ground Turkey Chili is a tasty, easy meal that’s full of flavor for Game day Parties that you can feel good about serving because its a healthier option! I call this Healthy Ground Turkey Chili because it’s lower in fat than when I make it with beef because of the turkey. (Disclaimer: Im not a doctor so please follow your own dietary guidelines for healthy eating.) You need not worry if something healthy tastes great with this turkey chili recipe because no one who has ever eaten it has even realized its a turkey chili. They just call it a good bowl of chili! How do you make Healthy Ground Turkey Chili? 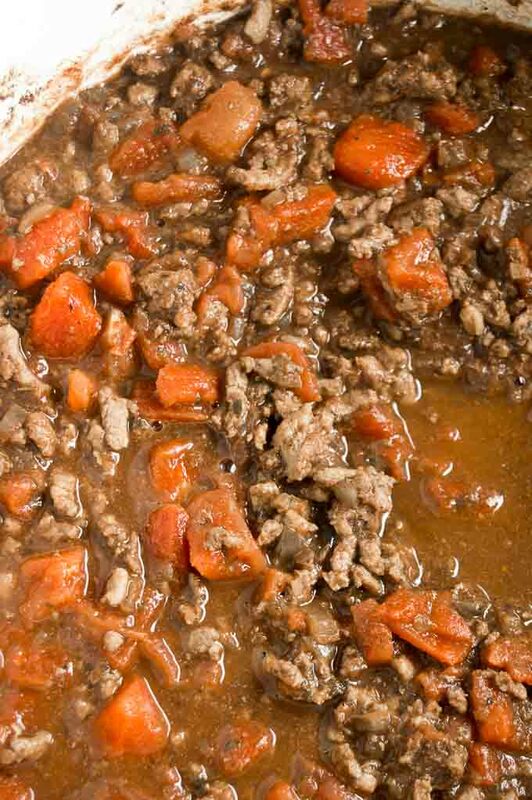 The most important thing is to maximize the flavor of the meat and spices you use in the chili. You’ll brown the meat with the onions have them caramelized on a low slow heat (pictured here). This lets the meat absorb the onion flavors. You’ll also want all of the flavors of the spices infused into the turkey so that every spoonful has all of the great flavors in it. 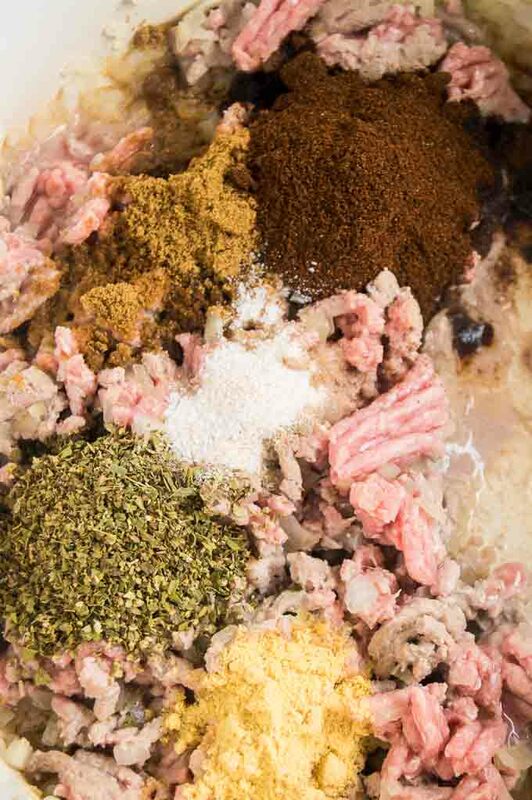 Once you have the onions and meat browned you will want to put all of the spices on top of the meat and let them have time to really get into the meat. After all of the spices have been stirred in you will add the tomatoes and the chicken broth (its ok to substitute vegetable broth if you prefer.) You’ll let the chili simmer for at least an hour and allow the liquids to reduce and all the flavors to really develop. It’s a great meal to let simmer all day on the stove if you have people wanting to eat at different times during the day. 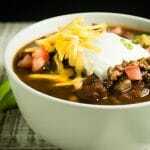 What is the secret ingredient that makes this Healthy Chili Recipe so good? The last ingredient I add to this chili is a little bit of …… wait for it. Dark Chocolate. It deepens the flavor just a little, pairing beautifully with the chili powder but it also ads a velvety smooth texture to the broth. I promise, it’s really good. If you are hosting a lot of people for a gameday viewing, you may want to have a couple of kinds of chili available. Here are few more you may enjoy! Five Bean Chicken Chili from my friend Michaela at An Affair from the Heart and this Award Winning Colorado Green Pork Chili form Michelle at A dish of Daily Life. Neither one will let you down on deliciousness! Craving more recipes for entertaining sign up for my mailing list here at the bottom of the page where you see “Join the West Via Midwest Community” or PIN THIS TO YOUR Game Day Food or Chili Boards for when you are looking for recipe ideas! You can also Follow me on Pinterest to get more ideas to have for making easy delicious meals and appetizers for any entertaining! Place a large stockpot on the stove at medium high heat. Add olive oil and onions and saute until onions are softened and turning a golden brown color. About 5-7 minutes. 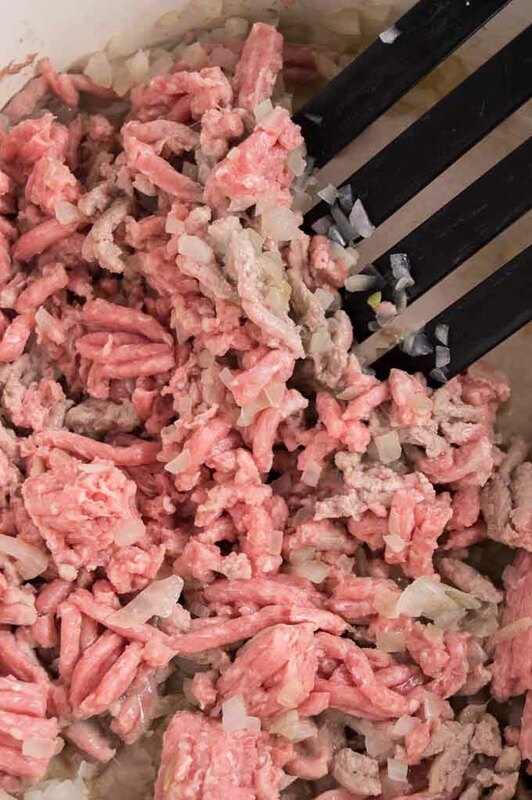 Add ground turkey and cook for 10-12 minutes until turkey is cooked throughout. Add all spices (chili powder, cumin, garlic salt and mustard powder) to the pan and sauce for 5 minutes to allow the spices to absorb completely. Add the tomatoes with juices, drained and strained beans and chicken broth and stir to mix completely. Lower the heat me medium and continue to cook for 45 mins minimum. Add the chopped chopped chocolate right before serving, allowing 5 minutes for the chocolate to melt completely. Serve with your favorite toppings - cheese, sour cream, avocado, diced tomatoes, jalapeños, Fritos.... whatever you like! This recipe is from a family friend of my mothers that has been in our family for over 30 years. I did adapt it a little over the years which is when the chocolate addition came in! Chili is the best and I’m loving the healthy twist you’ve given it with the turkey. Can’t wait to add this to our menu! You really surprised me with adding chocolate in your chilli… I made thousands of chillies but never added anything unusual . You inspire me ! 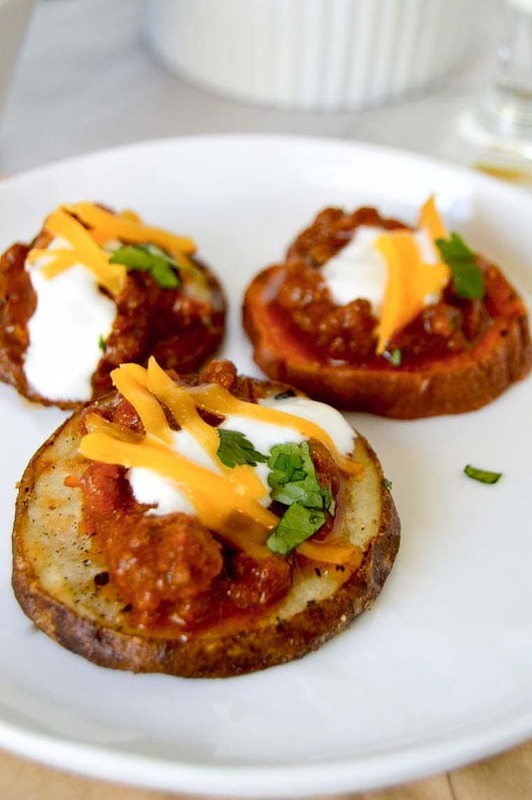 This looks like the perfect game day food! I have never made chili with turkey, but that is about to change! Lovely recipe. When I don’t have dark chocolate for my chilli, cinnamon works a treat too. Love the spices used here. Sounds yum. This sounds amazing and I love chili because it is so versatile!! Perfect for game day, you are right! Also – I love how you put it on Sweet Potatoes! Who would have thought!! Great idea! Ooooh, this sounds so delicious! We often use turkey in our chili, but I have never added your secret ingredient before!! I am SO going to give that a try! 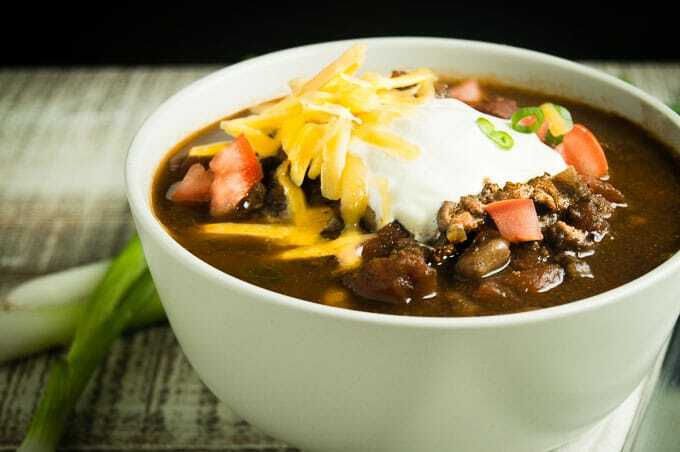 Chili is such a great and easy way to start eating healthier… and if you want to make it fluffy chili, it is easy to do that, as well. I love a classic pot of chili. Turkey makes such a great substitute for beef! oh i love this! have been watching what i eat since the new year and this is a perfect option. thanks! This chili sounds so incredible! I love the healthier spin with turkey!